You are here: Home / Rider News EU / Sustainable2Wheels Success! 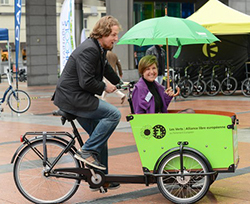 Last week’s Sustainable2Wheels event organised by ETRA (European Twowheel Retailers’ Association) at the heart of the European Parliament in Brussels, has been hailed a great success! 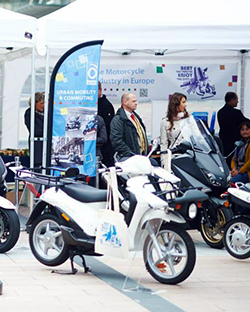 The event was organised for the fourth time during European Mobility Week on the esplanade of the European Parliament, positioned in the right place for European policymakers to take notice and understand the issues of 2Wheels – bicycles, electric bicycles, scooters and motorcycles in European policies. The event consisted of various presentations/demonstrations, with more exhibitors at the event this year, a number of projects and organisations presented their initiatives in the field of sustainable transport for a 2Wheel solution. ETRA reports that there were clearly also more members of the European Parliament and representatives of the European Commission present at the event. ETRA said, “They came to take stock of the latest 2Wheel technology as well as to enter into dialogue with the representatives of the national trade associations. Besides BOVAG, there were also representatives of the Belgian, Danish and French dealer associations. The event also hosted two well-attended political debates. First, Vice-President of the European Parliament Isabelle Durant and the Bulgarian MEP Preslav Borissov entered into discussion with a representative of the European Commission, a representative of the 2Wheel sector and a researcher on the role of 2Wheels in European environmental policy. In the second debate MEPs Brian Simpson and Michael Cramer talked with the other panellists on 2Wheels in urban transport policy. Motorcycle organisations, that we are aware of that attended with display stands, included the FIM (Fédération Internationale de Motocyclisme) and ACEM (Association des Constructeurs Européens de Motocycles) the Motorcycle Industry in Europe. 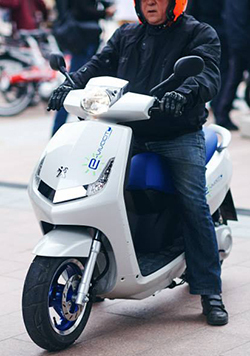 ACEM representative manufacturers gave live demonstrations of the world’s first hydrogen fuel cell Powered Two-Wheeler to earn type approval, a Suzuki Burgman and the prototype of the BMW electric scooter. On the ACEM stand, manufacturers showcased an exciting line-up of innovative, fuel efficient and enjoyable vehicles – from ultra-efficient internal combustion engines, to zero emissions electric and fuel cell propulsions, Electric mopeds and scooters where also available for testing. At Right To Ride in the grand scale of European promotion and presentation, we couldn’t agree more with what ETRA has said, regarding powered two wheelers of whatever power delivery. What is especially relevant is, that all organisations need to be active and engage with the European institutions by means of lobbying and promotion activities, if you have no purpose or a dedicated reason, there is no use in standing outside throwing rocks to get attention. 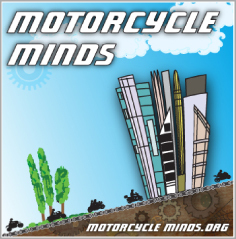 So we are quite bemused that FEMA (Federation of European Motorcyclists Associations) has made a statement, not for the first time, regarding European Mobility Week, which the Sustainable2Wheels event is an integral part. Well, if you are in and part of these events, then you can only aim to win, to present your point of view and positions. The debates at the event did mention, “That the interaction between the local and the European policy level is still up for a lot of improvement.” so maybe there is some sort of recognition that improvements are needed. 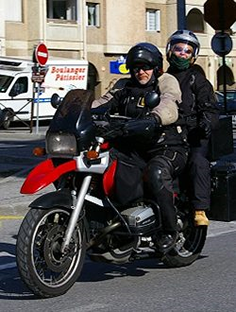 Or maybe like ETRA – ACEM – FIM it is up to motorcyclists to push, cajole, lobby, push again and actively present motorcycles – the powered two wheeler – not only to the EU policy makers but to our own policy makers for inclusion! We have written to the organisors of European Mobility Week, asking them to comment if they thought that there was a lack of involvement, a lack of evolution, a lack of consultation of the PTW (Powered Two Wheeler) community as regards to European Mobility Week. In other words, how PTW’s fit into the European Mobility Week campaign? We await their reply with interest! I do wish that people wouldn’t call them zero emissions, if it’s a plug in it has to be charged, be it from coal, gas, wind or solar it has emissions somewhere in the power/equipment production process, likewise fuel cells require a fuel, that needs separation which takes power (see above) so isn’t ‘zero emission’! Displaced emissions is a truer description.